Treaty of Waitangi. The Addemans booked passage to Providence, Rhode Island and arrived in the Spring of 1845. A number of conflicts did break out between the British settlers and the Maori from 1845 to 1872, particularly in the far north of New Zealand where the Addemans had lived. Despite their quick departure from New Zealand, the Addeman family was able to settle quite nicely into a new life in Providence. Thomas and Mary Ann had three more children after arriving in Providence. The description of Thomas' career varied over his time in Providence including: confectioner, manufacturer of leather preservative, leather preservative, trader, leather presser, and manufacturer, but it is clear that he was definitely involved the production and preservation of leather products. We are pleased to offer what we believe to be a unique, labeled Thomas Addeman leather preservative bottle. 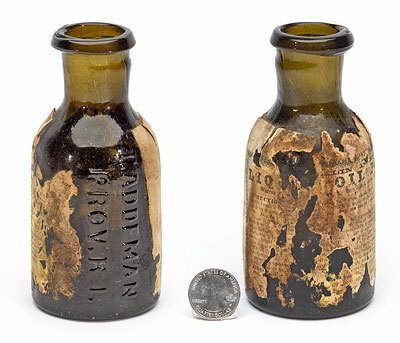 Thomas probably placed an order for these bottles in the mid to late 1840's at the newly opened Granite Glass Works in Stoddard, New Hampshire. This extremely rare and exciting bottle is fresh to the marketplace and a true early New England survivor. It is currently the only known example.